Discussions Magazine Music Blog: An EXCLUSIVE interview with REVEREND HORTON HEAT! An EXCLUSIVE interview with REVEREND HORTON HEAT! For nearly two decades, Reverend Horton Heat has remained on the top of the Alt-Rock heap. With their mixture of Rockabilly and Modern Rock, the trio has managed to carve out their own niche by reaching further back into Rock’s rich heritage and creating something new for ‘the kids’. When they released their debut album in 1992, who would have thought that they would outlast most of their contemporaries and still proudly carry the Primitive Rock torch that The Cramps had dropped somewhere back in the late ‘80s? While Reverend Horton Heat is a band, that name also refers to the leader of the trio, who used to go by the name Jim Heath until Rock ‘n’ Roll came a-calling. The Rev (as he is usually called) and his mates have just released a stunning new album on Yep-Roc called Laughin’ And Cryin’ With Reverend Horton Heat. The album sticks to the lovable Horton Heat formula while also stirring things up a bit. The wall of distorted guitars has been replaced by a more subtle and earthy sound while the music is more Country-based and the lyrics are more wild than ever. To these ears, it’s the most accessible album of his career… and the most timeless. I had a chance to catch up with The Rev and talk about the new album and whatever else came to mind. SPAZ: What kind of music were you listening to in the Heath household while you were growing up? REVEREND HORTON HEAT: Good question. Musicals like ‘The Sound of Music’ and ‘The King and I’ were always something that was around. My parents were really from the Big Band era so there was a lot of Glenn Miller and Tommy Dorsey. Perry Como and Andy Williams got a lot of play. My father was into Country Music more than my mother was: he liked Tennessee Ernie Ford, Al Dean & the All-Stars and Bob Wills. However, it was my mother, though she liked the musicals, Big Band, Gospel and Classical, who would always play the radio in the morning and through the day. The radio always played the hits of the day and Rock ‘n’ Roll. I remember being crazy for the song ‘Light My Fire’ by The Doors. Once, on a road trip, we stopped to get something to eat and I made my parents let me stay in the car, with the keys in, so the radio could still play ‘Light My Fire’. They weren’t really into Rock ‘n’ Roll since it was before their time, but they were both really good singers with a wonderful appreciation of all music forms. My mom played piano and my dad played ukulele, that’s how I got into playing an instrument. It was my cousins who turned me onto Johnny Cash, Carl Perkins, Bluegrass and Creedence Clearwater Revival. I discovered the Blues at a mom and pop store in Corpus Christi, Texas called Ashley’s Records and Tapes. SPAZ: Do you remember the exact moment that you realized you wanted to become a musician? RHH: When I saw the Beatles on the Ed Sullivan Show, I heard the girls scream and I thought, “That’s pretty cool.” However, it was much later, when I was in a Rock band in my high school years, that I started to realize that I could play and write. 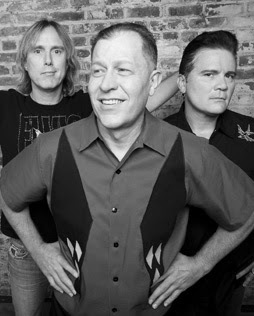 SPAZ: How and when did Jim Heath become ‘Reverend Horton Heat’? RHH: I had been in some pretty fun and successful cover bands, but that’s all they were. Then, I was working as a loader/soundman at a place in the Deep Ellum area of Dallas called Theatre Gallery. They also would rent my PA sometimes and I was living in a loft that was actually in the club that they called the ‘Heat Seeking Missile’. They called it that because there were no windows or A/C – however there were big roaches. The owner, Russell Hobbs, heard me playing my songs and said that he would give me a gig at his new bar across the street called The Prophet Bar. When I showed up to play my first gig (just me, no band), Russell came up onstage as I was setting up that afternoon and said, “Your stage name is going to be Reverend Horton Heet”, ok? I said, “What! ?” I didn’t like it, but he had already made flyers and put that in the paper, so I ran with it – except I had to make the ‘Heet’ into ‘Heat’. I’m now grateful that he didn’t say that my stage name would be ‘Dog Dookey’. Honestly, I was so glad to have a gig, I didn’t care. I was broke. Anything positive was acceptable. And, it was me playing my own songs – not many cover tunes. SPAZ: What did you think of the whole Rockabilly revival scene of the ‘80s (Stray Cats, Polecats, etc)? RHH: In some ways, Reverend Horton Heat was a part of it. I was in a band called Teddy & The Talltops in Dallas in the early ‘80s. We opened up for the Rockcats once. Also, Reverend Horton Heat started in late ’85 or early ’86…those years are hard to remember, so I’m still not certain what year. Moreover, I love the Stray Cats, the Blasters and Robert Gordon. I’m not sure what I would be doing if it were not for those guys. My friend Ted Roddy calls it “The Big Rockabilly Scare of ‘83”. It’s funny that while I was in a band in Dallas called Teddy & The Talltops, Jimbo (Wallace, longtime RHH bassist) was in a band in Houston called “The Teddy Boys”. SPAZ: You have been classified as Psychobilly, Punkabilly and Rockabilly amongst other similar genres. How would you classify Reverend Horton Heat? RHH: I think that it’s best to avoid classification. However, for people who don’t know what I do, I tell them that we’re a Rock ‘n’ Roll band that’s influenced by ‘50s music especially Rockabilly. But, I go on to tell them that if they come to one of our shows, you might see a Punk-style mosh-pit. That at least gets them in the ball-park concerning my whole deal. SPAZ: Laughin’ And Cryin’ With… has a much warmer and more authentic sound than many of your previous harder edged albums. Did you spend a lot of time studying the music made by your influences or did you just let it come natural? RHH: Well it’s all kind of a long story. I wanted to keep this album on the non-serious side. My idea at first was to make a ‘classic Country’ sounding album that was all songs with funny lyrics. However, it didn’t end up being exactly that, but close on some things. Right before the mix down, I came into the studio with a CD of some great classic Country from the early to mid-‘60s, Rockabilly from the ‘50s and a couple of pretty authentic modern recordings of some Surf and Blues stuff. As I played them for the engineer, it became obvious that what I wanted to do with the mix was way different than anything that studios do now. For one, just about all of the mid-‘60s, early stereo stuff had instruments either in the far left speaker or far right. In other words, for example, the drums would be only on the right side and the background vocals and guitar would be only on the left. Stuff like that are not things that anyone does anymore. I thought that it was cool that we tried that on several songs. Several songs are in mono, too. Also, we didn’t put a lot of the super low-end on the mix as the reference songs from the ‘50s and ‘60s had none. This is really different from what everybody now does on every modern recording. I also liked the room mics on the drums a lot. Also, having Tim Alexander there was great. Tim’s the keyboard player for Reverend Organdrum. He co-produced the album and played piano, bajo sexto, and accordion. There’s more to tell, but I’m getting too long-winded. As far as coming natural, the style of the songs came naturally but no recording by anyone ever comes completely naturally. The studio is a very sterile environment. Songwriting comes naturally after a lot of work. That sounds like a Yogi Berra quote. Ha, ha. SPAZ: The new album deals with everything from the Hindenburg and Death Metal bands to paychecks, alcohol, wives and babies… Where do you find your lyrical inspiration? RHH: I take real life, then, twist it into something a little funny and odd. I also like straight ahead lyrics without a lot of hidden meanings and abstract stuff. I think that it’s pretty neat that I have a relationship song based on the crash of the Hindenburg - ‘Aw, the Humanity’! SPAZ: When you put the tracklisting of Laughin’ And Cryin’ With… together, did you think of it as one whole set of songs or do you still think of a Rev album as a two sided beast? RHH: Both. The song order is a little different on the vinyl version. But even the CD version has a bit of the vinyl inspired running order. SPAZ: What is your format of choice: CD, LP, mp3, 7” or other? RHH: I like them all. You know, I kind of do all of the above equally. I’m on the road a lot, so I guess that mp3 is a little ahead then. I am so, so glad that there will be a lot of vinyl pieces printed for this album. SPAZ: You’ve been on independent and major labels throughout your two decade long career. In hindsight, are you satisfied by your years on Interscope? Would you have preferred to stay indie? RHH: At the end of the Sup-Pop days, they were getting to be a little bit intrusive – like a major would be anyway. I’m liking Yep-Roc a ton. They promote our tours even if we don’t have a new release. I’m kind of oblivious to the labels anyway. I do my thing. SPAZ: How does it feel to know that you have become an influence to a new generation of musicians? RHH: I have? Damn. Good…I guess. I’d better play really well on this next trip. SPAZ: What do you think of the current music scene? RHH: I think that there are a lot of great musicians out there. It seems like more and more young people are figuring out that it takes real talent to play an instrument. It seems that there is a least a little backlash to computer-made music. I wish that they would quit calling a DJ ‘live music’. SPAZ: What’s next for Reverend Horton Heat? RHH: We’re releasing a mostly country album and going on a Heavy Metal tour with Motorhead. I know that it’s all going to work out just great. Ha, ha. After that, there will be more infinite touring. I’m thinking that the next album will be an all out, no holds barred psycho-fest. But, you never know. SPAZ: What is currently spinning on your CD and DVD players? RHH: My iPhone’s music got erased when I had to fix it recently, but I’ll get the music back on it again. My computer recently had Jerry Lee Lewis live at the Star Club in Hamburg. My turntable has Bill Doggett, ‘Dance Awhile with Doggett” and my car has a CD by the Psychobilly greats The Guana Batz. I don’t really have the time for DVDs, but on the bus recently, we had a pretty awesome early concert by Deep Purple – in black and white…no purple. Special thanks to Kristin Attaway.